Brokis shadow collection combines cutting edge design with elegant glassware in a new take on the timeless French atelier pendant light. Designed by Lucie Koldova and Dan Yeffet, the light fitting is wood-carved and finished in a matt black coating that highlights the woods grained texture. Formed from multiple layers of sumptuous smoked glass, the light has been mouth blown in the Czech Republic- a country renowned for its artisan glass making. The purity of the lights sculptural shape and the beautifully curved edging is accentuated by the hidden light source of a warm toned LED spotlight. 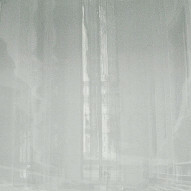 Shade in transparent smoke grey glass with glossy surface. Wooden neck in European Oak stained black. Black textile cord. 1 x 5W DIM GU10 EU 220-240V bulb. Compatible with DALI dimmer system.